Terrace and basement. Go-go dancers during the weekend. Used to be known for being the best gay bar in town, but times have changed but th Banana is still popular, nonetheless. I paid 12 euro (with drink included) for a nearly empty bar and was greeted by a rude bartender. It&rsquo;s not worth it. Went on a Friday night around 1:30am. Not many people, paid 12 euros to get in, but received a drink ticket. Once you leave, you're done for the night. There are better options! I remember stopping in here around spring of 1999,& it was really humming. I was sad to see the place looking sort of tired & run down. Could be good but staff is rude. Too bad. Not going back. This place appears great at first - hot dancers, great music and atmosphere. Unfortunately, my partner and I ordered very expensive drinks and were seated watching the dancers - we arrived early to get good seats. We had barely started our second drinks when we were TOLD to give our seats to a group of young women who had ordered two bottles of spirits. When I refused, I was told that I would be thrown out. Needless to say, we left after letting the manager know how upset we were. He was not all apologetic. Not nice, not reasonable and not something that should happen in any bar, let alone a gay bar. Neither we nor any of our friends will be going back. 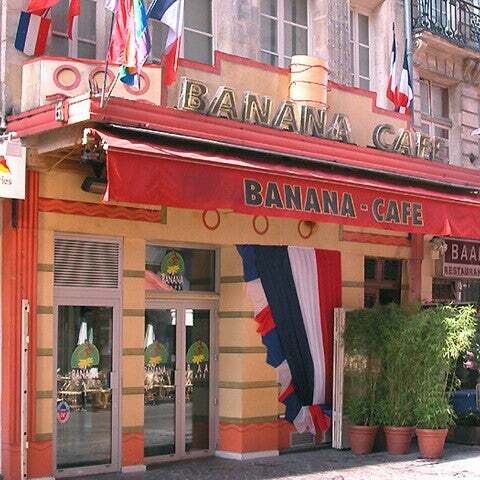 The Banana Cafe is a great place at any time - early evening it´s great to have a cocktail or even a coffee - the best nights though are Thursday, Friday and Saturday when the Go -go boys are dancing on the bar. They often have themned nights so it´s a fun place to go. Downsatirs there is a piano bar with great live music. Drinks a little expensive - but we are in Paris! I really enjoyed spending time there, meeting people and having fun. The mood is really cool. The crew is really kind and friendly. I'll come back to there when I'll be in Paris, and you really should do the same!